Africa represents the fastest growing continental opportunity in the next two decades. Six of the 10 fastest growing economies in the world are in sub-Saharan Africa including Tanzania, Djibouti, Ethiopia, Congo-Brazzaville and Malawi. These prospering economies and Africa’s growing middle class present companies with new possibilities to strategically advance and build their brands. Africans are increasingly tech-savvy, brand-aware and willing to pay for premium products and services. Despite this progress, Africa’s television infrastructure remains highly fragmented due to lack of resources for acquiring expensive content. CAfrica Sports has unlocked the African broadcast market by developing formal agreements with individual broadcasting companies by offering content free-to-air. 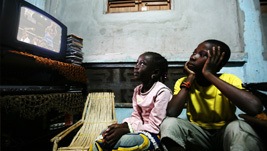 Today, TV advertising in sub-Saharan markets exceeds $2 billion and that investment will rise as multi-national companies expand into African markets. To tap this growing opportunity, contact us to learn more about packages and sponsorship opportunities on Africa’s leading free-to-air broadcast network. Within just a few months of licensing its content to CAfrica Sports, the NBA more than doubled its African country exposure. CAfrica Sports Chief Executive Officer Robert Fogler.